Yesterday was our first full day on the Malaysian island of Langkawi. We took Rowan on a tour of the mangrove forest, where we saw lots and lots of long-tailed macaques, white bellied sea eagles, and coral fish. 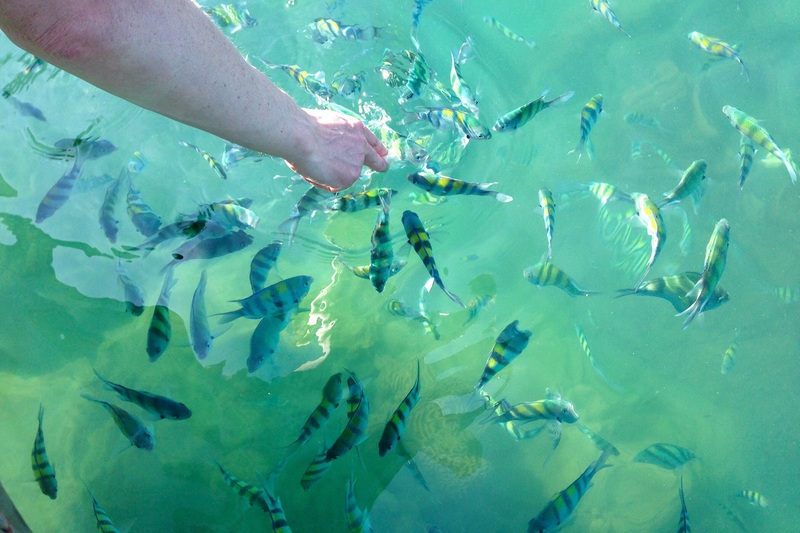 We got to feed the coral fish pieces of bread from the boat out on the Andaman Sea and then headed back to Langkawi, meandering along the Kilim river to see the macaques. We saw about 20 of them in a group, including two females with little, tiny babies clinging to their chests. The Eagles were nesting in the trees by the river and soared overhead as we went past. They are very large, with wingspans that can reach 170 cm and our guide, Rachel, was very proud to tell us all about the birds. The white bellied sea eagle is the bird of Langkawi; in fact, the “Lang” part of Langkawi comes from the word “galang”, which means eagle (the “Kawi” means “limestone”, which is found in abundance on the island). They eat snakes, lizards, fish and other, smaller birds. When the males try to attract females, they build a comfy nest in the trees and then do a 180 km per hour dive above it to prove how fast they are. If a female is impressed, she will choose the male and stay in his nest. We thought that would be an awesome sight to see! It was a hot and sunny day and the boat ride was very relaxing. We loved floating by the mangrove trees looking for animals. We saw a big Monitor lizard basking on a rock and even went through a shallow cave called Crocodile Cave, but the name just comes from the fact that the opening looks like the head of a crocodile floating in the water, so unfortunately, no crocodiles! 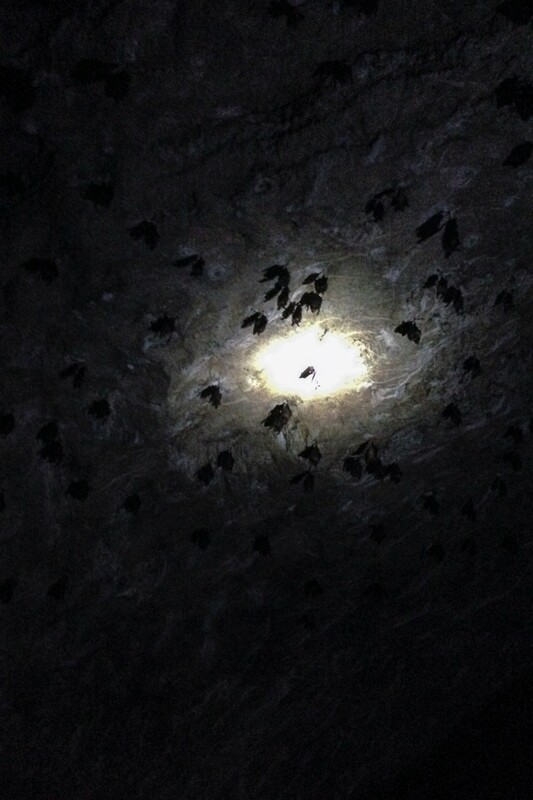 Then we walked through a bat cave (! ), which smelled incredibly bad because of all the bat guano, but we did get to see little, tiny fruit bats nesting on the cave ceiling, which was very cool – and made all the stinkiness well worth it. We were told the bats sleep and poop all day, so we had to keep our mouths closed while we looked up at the ceiling, lest we get an “extra snack”. Ewwww. We ate lunch at a floating restauarant and then headed to a small, beautiful beach for a quick swim, before going back to our hotel and the pool. There, Rowan and I swam and splashed around in the water for a couple of hours before getting showered, dressed and ready to head out to the hotel’s Thai restaurant, which is set out on supports over the water near our cabin. We watched the sun set and the constellations come out. Kevin thinks two of the bright points of light were planets. My bet was on Mercury for one, but Rowan had it pegged for Mars. We were both just happy that the night sky is so sparkly here. Check back in tomorrow, when we’ll tell you about our swim with the sharks! You must of had a fabulous day. Wow…incredible. How is Rowan adjusting to food and spicy stuff? Does he love traveling? You’re creating a global citizen here…so cool. Hi Anna, yes, Rowan loves travelling, though he doesn’t like waiting in queues at the airport. Those can tend to be pretty tedious with a 6-year-old in tow. Just like at home, he doesn’t like or eat hot-spicy food, but we manage to find him food that he likes, like rice and veggies, pizza, cheese sandwiches, noodles and veggies, or, the perennial favourite, french fries! Now we’re in Perth and cooking most of our own food, so he’s back to eating all the vegan salads and dishes that he’s used to, which is nice. The best part about traveling when Rowan is so young, is seeing how quickly he adapts to new situations and matures right before our eyes. Only one week in and we can already see a big difference. It really is incredible. Hope you, Rahul and the girls are doing awesome! Kisses from all of us!